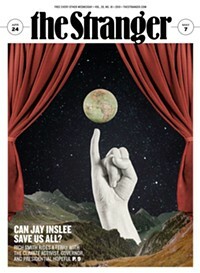 As Mayor Greg Nickels was being lauded in Time magazine last week for his nationwide push on reducing global warming (that's him getting good press in the national mag below), two UW scientists released a report that calls into question the true impact of the mayor's widely praised plan. The report, released at the council's morning briefing on July 2, took a hard look at Nickels's vaunted Climate Action Plan, which came out of the U.S. Mayors Climate Protection Agreement that Nickels launched in 2005. Under that initiative, mayors of 592 U.S. cities have agreed to implement policies that will reduce greenhouse gases to 7 percent below 1990 levels by 2012—the same reduction that would have been required under the Kyoto Accord abandoned by President Bush in 2001. Monday's report, presented by UW scientists Marcia Baker and Robert Charlson, concludes that while Kyoto was "a small and largely symbolic first step when it was presented in 1997... the magnitude of the problem we face has subsequently grown considerably." Setting Kyoto as a goal was "very reasonable in 1990," but it "doesn't go nearly far enough to reduce emissions" now, Baker told the council. If Seattle is serious about reducing emissions, Baker continued, it needs to reassess its plans for major road projects, including SR-520 (which the mayor and council want to expand to six lanes) and the Alaskan Way Viaduct (which Nickels wanted to expand into a wider underground freeway). It's not just that the mayor's goals miss the mark. In many cases, cities aren't even on track to meet the Kyoto bar. According to a report released by the Minneapolis-based Institute for Local Self-Reliance last year, many of the cities that signed on to Nickels's climate challenge "will miss their goals by a large margin." Given that liberal writers like David Goldstein have lavished praise on the mayor for convincing cities to set the out-of-date Kyoto as a target ("While the feds fiddle," Goldstein wrote, "Nickels leads"), it's worth taking another look at what Nickels's goals actually are—and how they fall short. Twenty to thirty new miles of bike lanes. Portland, a smaller city than Seattle, has 10 times as many miles of bike lanes. Tolling congested freeways and creating HOT lanes that allow single-occupancy car commuters to buy their way into carpool lanes. Those are fine ideas, but they don't go far enough; environmental leaders now say that every new mile of highway should be tolled. Improving fuel efficiency by encouraging people to idle less, fill their tires properly, and drive at more "moderate" speeds. Yeah. Good luck with that. Increasing the use of biodiesel citywide, including corn-based ethanol. Corn-based ethanol causes more environmental damage than it mitigates, because of energy-intensive farming practices, and it diverts farmland previously used for growing food. Buying "carbon offsets" to offset City Light's greenhouse-gas emissions. Offsets frequently include the planting of more trees, a practice which a 2005 study showed has little to no impact on global warming (because trees hold more heat than the grass and crops they replace), and in some cases actually increases temperatures.